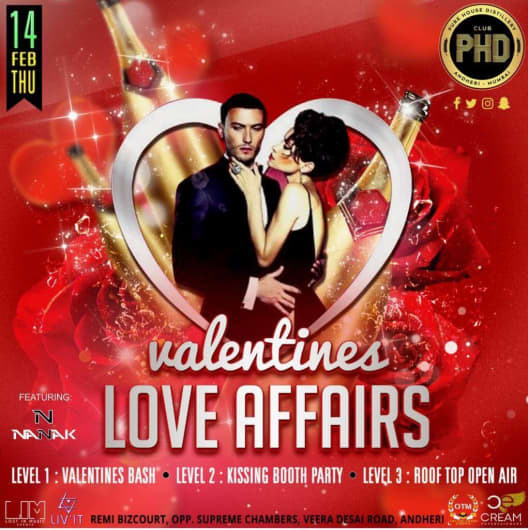 We bring to you a great Valentine's with a whole day of Partying at our very own CLUB PHD. Pamper yourself and your better half with mesmerizing music and some great food and alcohol. We also have a Kissing Booth set up for all the lovers to make a call to the LOVE GOD CUPID. Secret Lovers Affair : 2pm-7pm. The Musical Affair: 9pm onwards. Buck Yourself Up For The Biggest Celebration. PS:- Dont forget to bring your Valentine. We are on till late. Special Details: Event will start 2.00pm onwards. Post 3.00pm cover charges will be applicable.